In short, except a lot of noise stemming from the brewing trade conflict, military action in Syria and fading euro-phoria on the back of growing German opposition against Macron’s Eurozone reform plans, the only “hard” changes since the last ECB meeting are currently benefiting the doves. But what does this mean for the future path of the ECB’s monetary policy? First of all, the ECB will have to find a consensus view on its own narrative. Remember that the ECB has always tied its QE programme to the “sustained adjustment in the path of inflation consistent with its inflation aim”. This means that even though QE was started to tackle a deflationary threat, the sheer disappearance of such a threat should not be sufficient to stop QE. Instead, the ECB’s wording has always made QE a “revamp-inflation” rather than a “fight-deflation” tool. With all that in mind, there are (at least) three scenarios for the ECB’s next plausible step. This scenario would follow the initial logic of QE as a deflation-fighting tool. With the ongoing recovery, closing output gaps and headline inflation at least above 1%, no single European central banker can still seriously talk about deflation. Hence, an end to QE would be the logical consequence. This scenario, however, would not only contradict Mario Draghi’s own words that he did not expect an abrupt end of QE, but it would also bring forward expectations about a first rate hike. This would be to an even earlier date than the mid-2019 recently advocated by Weidmann and other hawks. Therefore, this scenario is extremely unlikely, though not completely impossible. This scenario currently seems to be the mainstream ECB call. It reflects the view that there seems to be a broad consensus within the ECB that QE should be ended but that diverging views only exist on the timing and details of this end. Another “lower for longer”, reducing the monthly QE purchases from currently €30bn to €15bn at least until the end of the year would be an almost organic next step in the ECB’s gradual end to QE. It would also leave the door open to another extension beyond 2018 in case of an unexpected slowdown of the Eurozone economy or new downward revisions of the inflation forecasts. At the same time, however, it could be too much for the ECB hawks who are clearly advocating a clear end date for QE. Another possible compromise between hawks and doves could be a so-called “much lower for much longer”, ie, an extension of QE for another six months but then at a very low level of about €5bn. This extension could then be combined with an end date. This scenario would become more likely in case the soft patch of the first two months of the year was to continue and if the June staff projections for inflation up to 2020 remain unchanged or are even revised downwards. Needless to say that there are more than only these three scenarios possible. In particular, combinations of scenarios 2 and 3 give multiple additional options. What counts most is obviously a definite end date to QE and how much in advance such an end date will be communicated. The end date is crucial. As soon as the ECB has communicated an end date for QE, the focus will immediately shift on sequencing. Sequencing will then be the ECB’s main tool to steer market expectations and rates. Will it be six months between the end of QE and the first rate hike or could it be more (or even less)? Currently, the ECB seems to be happy with market expectations that sequencing means six months. Another topic in the beyond-QE era will be the reinvestments of maturing assets held by the ECB. When would the ECB stop the reinvestments? At the moment of a first rate hike or later? 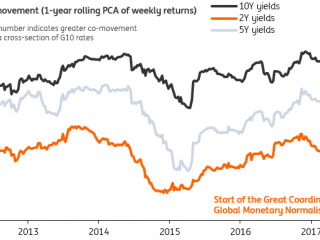 Given that the ECB has been mirroring and following the Fed’s QE experience substantially, a continuation of the reinvestments looks likely. In the US, the Fed’s reinvestment programme went on for another three years after the official end of QE. Our base case scenario remains another extension of QE at least until December. We even consider the possibility of a “much lower for much longer” scenario, which would push the end of QE into 2019 and the first rate hike into the second half of 2019. To see this happen, the current soft patch of the economy would have to be longer-lasting than expected and the inflation outlook at the June meeting should – due to structural factors – remain benign. All of this means that this week’s meeting will be a general repetition or just the prelude to the big June meeting. Given the nitty-gritty discussions and controversies on the timing and details of tapering, it will be a general repetition the ECB would probably prefer to perform behind closed doors, as currently, silence is clearly more golden than any words.